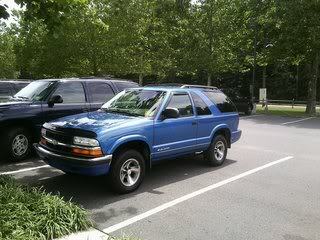 I really want to drop my new 2 door blazer because I love the look of the dropped truck. This truck is equipped with that z85 suspension. Im thinking of doing a 2 inch spindle/ zq8 coils up front. Then a 4" block drop in back. Will I have problems with the front end wearing out and stuff with a combination like that? Will I have problems running the stock wheels and tires? I need to get new tires a.s.a.p anyway so would the 235/70/15 work? Thanks a lot. p.s. I lowered my old 4wd jimmy but Ive never touched a 2wd.. sorry if i sound stupid haha. I've got that same drop if you wanna check out my pics. That was right after i did everything, springs have settled now. I'm also running the stock wheels and tires. I actually did everything belltech. 2 in. spindles and 1 in. coils in front and 3 in. drop leafs and 1 in. blocks in the rear. The rear leafs IMO are pretty soft. My rear actually does bottom out as some would say theres does not. So c-notch will be going in. This is also my first lowered vehicle. For the premature wear on the front end i dont really see it an issue if you do not do the drop right and/or an alignment. Definately get your alignment done. For some reason my caster was thrown off, apparently after talking to some people the drop spindles do affect this but everything is in spec now. I love the ride height and was thinking about doing the same drop. what parts from what manufacture did you use? any rubbing with the tires and what not? Everything is Belltech. Ride quality is great. Replaced all bushings with urethane also. No rubbing issues at all. I did have to notch the rear but that wasn't hard. After I did that didn't bottom out anymore.